This is a discussion onWJB Hub, Bearing & Seal Instant Rebate at RockAuto.com! within the RockAuto forums, part of the Supporting Vendors category! 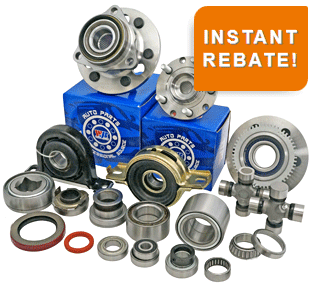 WJB is offering RockAuto customers an exclusive 10% off instant rebate on the entire line of WJB Wheel Hubs, Bearings and Seals the entire month of March. Established in California in 1992, WJB has focused on and excelled at making automotive and industrial bearing products. Their philosophy is to produce premium parts that are extremely competitively priced. WJB has been an OE supplier to car manufacturers since 2012. Their factories are ISO/TS 16949 certified. Whether you are looking for Wheel Hubs for a 2015 Toyota 4Runner, Wheel Bearings for a 2006 BMW 325i or Wheel Seals for a 2001 Chevrolet S10 pickup, RockAuto has what you need from WJB. To see the WJB parts we have for your vehicle, go to the RockAuto catalog and click on the "Brake & Wheel Hub" category. Take advantage of the instant 10% rebate on WJB Wheel Hubs through March 31, 2018!